NORMAL trading will resume at the Kennedy Centre this weekend as roadworks and closures come to an end. Access routes to the popular Falls Road shopping mall will be open after roads were closed to allow for works to accommodate the Belfast Rapid Transit (BRT) system. Speaking to Daily Belfast Kennedy Centre Manager John Jones said he was delighted to get back to full speed at the centre again. “Although we understand the difficulties in having to close the roads to allow for these works, the closures have definitely had a negative impact on the centre and many other business in the area,” he said. “Finally, the works around the centre are fully completed and there will be no further distractions allowing us to get back up to full speed at the centre. On the positive side we now have an entirely newly surfaced road in the vicinity of the centre and we can gain the benefit fully of our new entrance and exit on a permanent basis. 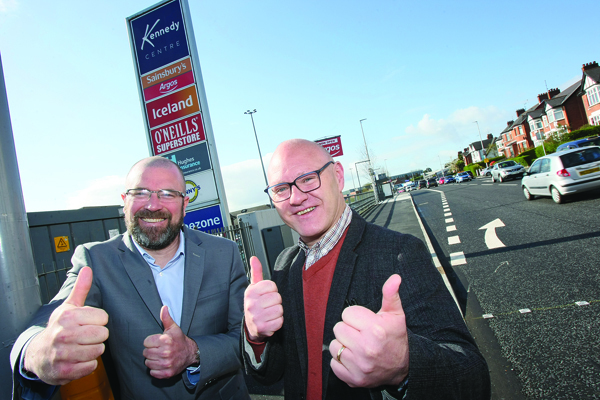 West Belfast MP Paul Maskey added that he wanted to thank business owners and residents for their cooperation and patience while the roadworks were ongoing. Paul Maskey urged the community to support local traders. “By doing so we assist the continued growth of West Belfast and support those who support the local community,” he said.